Ryan Blaney qualified the No. 12 REV Ford Fusion in 10th position for the Bass Pro Shops NRA Night Race at the Bristol Motor Speedway. From the drop of the green flag, Blaney was on the move toward the front. He quickly moved the REV Ford to the lead on lap 17 and held the top spot until a competition caution on lap 62. On his first pit stop, Blaney took four tires, fuel and air pressure adjustment to aid a car that was tight on the bottom and loose on the top. Blaney restarted second on lap 63 and grabbed the lead one lap later. In extremely heavy lap traffic, he held off Kevin Harvick by less than a nose to win Stage 1. His next scheduled pit stop came during the stage caution on lap 129. Crew chief Jeremy Bullins and the REV crew made larger adjustments including wedge and air pressure to help the REV Ford with turn on corner entry. Blaney wrestled with the handling of his Ford early in Stage 2. He rode inside the top-five until lap 192, when he grabbed the lead from Chase Elliott. Blaney led until a caution came out on lap 199. Under the caution, Blaney received another air pressure adjustment to help with his car firing-off too loose. He scored a fifth-place finish in Stage 2. The driver of the No. 12 REV Ford maintained a spot inside the top-five early in the final stage, but he lacked forward drive. He pitted on lap 355 for more air pressure adjustments. Unfortunately a loose wheel forced Blaney to make a second stop, costing him valuable track position. But Blaney rebounded, working his way his way back through the field. He lined up fifth for the final restart of the race on lap 487 and held on down the stretch for a sixth-place finish. 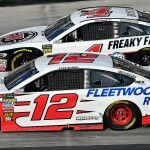 Blaney also officially clinched a spot in the 2018 NASCAR Playoffs with his 12th top-10 of 2018 and best-ever Cup series finish at Bristol.